Site programs can be installed from CD or from the install program downloaded from this web site. If you are installing from CD please put the CD in a CD drive on your computer. The install program should start automatically, if it does not then please run the program setup.exe that can be found on the CD. If you are installing from a downloaded installer program please run the program. 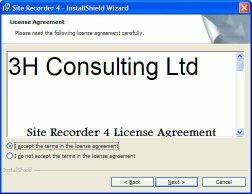 Please ensure that you have administrator rights on your computer before installing Site Recorder. 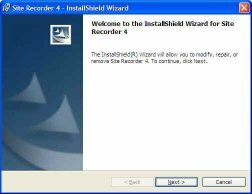 If you do not have these rights then the install will not complete and Site Recorder will not run. Once started the program will install the Site program. Shortcuts will have been added to the desktop for the Site program and the manual. Once the program has opened, to help you get started the online manual can be found on the Help menu or by pressing the F1 button. See also the Getting Started page.